It seems some others have mentioned the same thing about potential overfeeding. Keep in mind, boas have a limit to what they will eat. Some will eat themselves to death, some will regulate their intake, but it takes a LOT of food to get them to stop eating. If your boa is willingly going off of food every so often, considering what you've said about his feeding and the large size for his age, that is likely what's going on. He's getting more food than he needs, so he's going off of food. I went through a similar experience with Cloud when I was unknowingly power-feeding him. He was eating jumbo-sized rats when he should have still been on smalls (he was 4.5'-5'), after a few feedings, he started missing feeds until he went from weekly feedings to every 4 weeks on his own. I dropped him back down, and he went back to eating weekly, but I no longer feed my boas that often. Your boa is already a few feet longer than my 2.5 year old boas at only 1.5 years old. 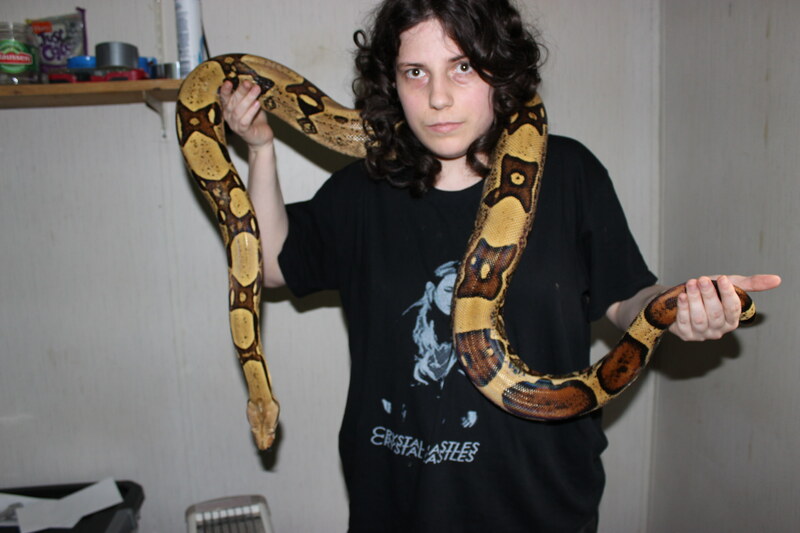 My boas that are an entire year older than your boa are 2'-2.5' shorter than your boa. They are both getting small rats every 3 weeks, not jumbos every 1 or 2 weeks. That feeding schedule is power feeding, and would explain his rapid growth. I do want to say, it is easy to assume that is normal growth and the feeding is acceptable, because most people do power feed their snakes and 6'-6.5' is common by 2-3 years old on the average feeding schedule. 1.5 years is a bit young, but I have heard of it. Most breeders feed their snakes with rapid growth in mind for early breeding. Instead of waiting 5-6 years for their females to properly mature and 3+ years for males, they get females to breeding size by about 2-3 years old and males as early as 18 months. This unfortunately reduces the viability of their reproduction, drastically shortens their lifespan (by up to a quarter of their potential lifespan), and increases the chance of mortality while gravid or from fatty liver disease. Since power feeding is the norm for breeders, and breeders have a lot of influence over the community, it is easy for inexperienced owners to assume that feeding method is ok. So many people are stuck on this feeding regimen, that even a lot of keepers who view their feeding as conservative still feed a lot more food than is necessary or healthy for boas. You want a slow, even growth for maximum health and longevity. Getting them up to adult sizes before 4-6 years old is quite unhealthy for them, but since that's a norm, it's hard to gauge what is healthy growth for a lot of keepers. Most of the biggest, most experienced breeders of boas (especially breeders that actually study boas in their natural habitat) feed in similar manners as I do, as they've found out that boas live longer and breed better when fed a lot less than the average keeper feeds their boas. Many boas would die by 6-15 years, so several breeders, such as Vin Russo, developed a dramatic rehaul in boa feeding to increase health in their collections. This is why my advise is such that is, and why I mentioned the possibility of power feeding to you with your boa. Last edited by CloudtheBoa; 02-21-2018 at 05:56 PM. Thanks! She came straight from Gray Rushin, already proven, top notch quality with multiple pastel lineages. She was bred for the first time at 7 years old, had a perfect litter of 19 babies, no stills or slugs. She'll be 10 years this June. One of her daughters really caught my eye, but I wanted a female that was already mature enough to breed, so I went with her mother. She ate tonight. Hadn't eaten in two weeks, which is her schedule now that she is on small rats and weighs 690G empty. So I put the defrosted and warm F/T rat on tongs, dangle in front of her for a little, and nothing. She looked interested, but didn't strike right away. So, I did what I have done in the past, put it down in front of her. She spent 1/2 an hour watching me feed everyone else, looking out the front of her tank, sniffing the air and even the rat, etc. Finally, she bit into the rat, got really excited, half struck while biting it, bit harder, and coiled it! This time she didn't coil for, seemingly, ever, and started chowing down quickly. She's a goof, but I love her. Nice to have another snake who happily eats even when I don't shake it for a while to elicit a strike. My BP, Shayna is so shy, she almost never strikes, and wants the rat put down, and me to walk away. Figment, my corn snake, could care less. If I shake for 1 second, he strikes, if I drop it in, he strikes, etc. He eats anything anytime! Anyway, very happy she is eating regularly (which she always has) and seems happy. She is really settled in now. 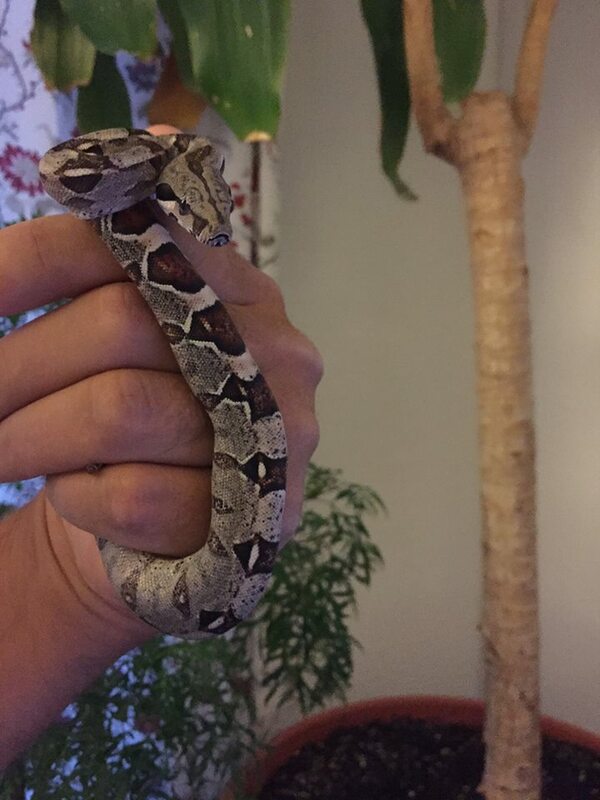 Okay, quick question, for the BCI/snake behavior experts out there. I have been hook training Behira for about 3 weeks now, and that is going great. I feed her at night with tank lights, and most room lights, off, so it's pretty dark. During the day/lights on is when I handle. Her lights are on from 9AM-9PM, give or take a few minutes. Lately, when I walk by the tank at night, she looks ready to strike/in hunt mode. She hasn't struck the front of the tank yet, but I wouldn't put it past her. I don't want her to get hurt, and I may be making a mountain out of a molehill, but should I be doing something differently? I always feed my snakes in near darkness/at night so they associate light with being handled. However, I have never had as aggressive a feeder as Behira. Even Figment, my corn snake, looks for food at night, but isn't ready to strike until he smells mouse. He does go completely APE once he is sure it's feeding time though. I only go by the tanks at night if I need to feed the geckos or it's snake feeding day. Otherwise everyone is left alone in the 5 tank stack (the tanks in the corner of my finished basement in a little nook so they do not get bothered unless I need to do something with them/the animals). Last night I fed the Gecko's and as soon as I walked by, she was out of her hide and in S/strike mode. Behira eats every 2 weeks, on Sunday, a small rat. She was 690G empty before last feeding (this past Sunday). She is a total puppy dog once stroked with the soft end of the hook, and completely mellow once picked up! Total sweetheart. Thank you for any and all thoughts! I wish I could help more with this but I don' have any good advice. Boas are a bit notorious for striking the front of the cage. Quite a few of mine do it and I have 2 that will do it anytime for any reason, just a really high food drive. I just try to move slowly when I'm in front of those specific cages as it seems moving by quickly is much more likely for them to strike out at. The worst thing I've had happen in almost 20 years of keeping boas is a lip getting caught on a tooth (with the help of my bf we pulled the lip back off the tooth and she was fine). These are boas that are not aggressive/defensive otherwise as well, as soon as I open the door and boop them with the hook, they are fine. Last edited by richardhind1972; 02-28-2018 at 03:32 PM. Thank you AbsoluteApril and Richardhind1972! Yeah, I am not worrying about her becoming aggressive. Again, she's a total puppy dog when being handled. I just think she has a hyper food drive, which is a good thing. Just ask Shayna, my BP, who didn't eat for 5 months this winter! I just wanted to avoid her getting hurt and make sure it was food driven. I don't want to scare her and that's why she is acting that way. Wait, scare Behira? She barely uses her hides! What am I thinking! She's a pretty bold little sweetheart, with a killer food response. That's all. However, she already had one bent tooth from missing a rat and hitting the acrylic door, or her a hide. That took care of itself though. I'll just keep chugging and handling her regularly. Funny, handling usually involves watching TV and her falling asleep on my chest. I may have mentioned, but I think I am the Boa Whisperer. Katie holds and she is all over the place, nonstop! Me, she falls asleep.